A solid product with an impressive list of features, though the sound quality is disappointing. Setting the DreamDock2 up is a breeze—you just plug it in, turn it on and let it set the time automatically and find the DAB stations available in your area. Learning to use some of the functions such as the presets might take a bit longer, but the user manual is well written and clear. The DreamDock2’s sound quality isn’t as good as you can find on other Roberts radios. The DreamDock2’s sound quality isn’t as good as you can find on other Roberts radios, and it can sound a bit muffled. However, you can adjust the EQ yourself to get a better sound, and overall the sound quality isn’t bad for a bedside alarm clock. The Lightning dock is compatible with Apple products that use a 25-pin connecter. This includes the iPhone 5 and iPhone 6, among others. You should check you have this kind of connecter before buying the DreamDock2. You can use the dock to play music while recharging an iPhone or iPod. This makes the DreamDock2 a convenient bedside radio if you have an iPhone 5 or iPhone 6 and want to recharge it overnight. The Roberts DreamDock2 has a useful remote control. As well using it to control the radio, you can also use it to control music from your iPhone or iPod. The display can not only be dimmed but also turned off completely to stop it disturbing you at night. 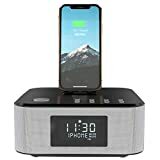 One thing that sets the DreamDock2 apart from many other clock radios is that the display can not only be dimmed but also turned off completely to stop it disturbing you at night. One of the most common issues people have with clock radios is that the display light can be too bright, but with the DreamDock2 that shouldn’t be a problem. Radio reception on the DreamDock2 is generally better than average, though this varies depending on where you use it. 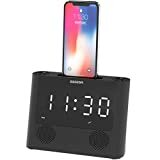 The DreamDock lets you set two independent alarms, and you have a choice of things to wake up to: a regular beeping sound, FM or DAB radio, or music from an iPod. You also have a choice of setting the alarm to sound once, daily, on weekdays or on weekends. The Roberts DreamDock2 is a solid product with an impressive list of features, though it does have a few shortcomings. The DreamDock2 has a lot to offer including a docking station, a fully dimmable display, USB charging, a remote control and a headphone socket. It’s quite hard to find a clock radio with all of these features, so the DreamDock2 is definitely a special product. On the negative side, the DreamDock2’s sound quality is quite disappointing for a Roberts product, though it is decent for a clock radio. It would also be nice if the radio had Bluetooth, though if you are buying it for the docking station this probably wouldn’t be necessary. If you’re not sure about the DreamDock2, there are several other high-quality clock radios you could consider. One popular alternative is the AZATOM Home Hub, which features a Lightning dock, Bluetooth and an FM radio. The Home Hub is cheaper than the DreamDock2, though unfortunately it doesn’t have DAB radio. 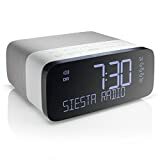 If you’re looking for something more high-end, you could consider the Pure Siesta Rise, which doesn’t have a Lightning dock but does offer FM/DAB radio and USB charging, and arguably has better sound quality than the DreamDock2. For some more options check out our roundup of the best clock radios available in the UK.